Since the Love Island closed its doors last month, the modern day Romeo and Juliets have done their damnedest to stay in the limelight. Between nightclub appearances and the very public – but very predictable – breakdown of reality TV relationships the Islanders just can’t stop courting media attention. 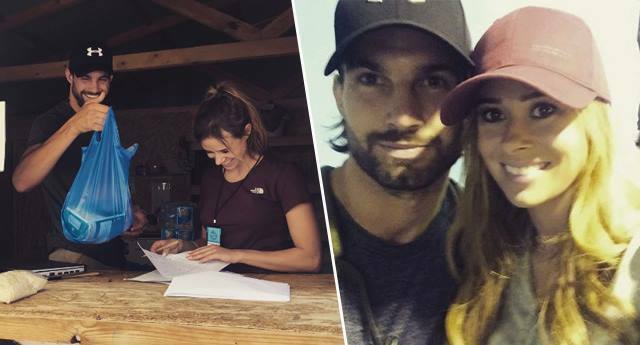 Apart from one pair: Camilla Thurlow and Jamie Jewitt. Today we were immensely humbled to join the Soul Food Kitchen team to help with the preparation and distribution of meals to homeless refugees in Thessaloniki. We met the loveliest volunteers who are not only giving their time here, but are acting as powerful advocates back at home. They have made the decision to #chooselove with @HelpRefugeesUK, and their efforts are making an incredible difference to wonderful people trapped in a desperate situation. If you would like to support them please do take a look at the #chooselove t-shirt, which is available on @asos – all proceeds go towards helping refugees across Europe and in the Middle East ?. The extremely talented @jamiejewitt_ is doing an amazing job of capturing footage of our time here with @indigovolunteers, and we cannot wait to share it all with you when we get home ? The self-confessed feminist and her Island beau jetted off to Greece to volunteer for charitable organisations trying to ease the strain on homeless refugees. Meanwhile, Montana and Alex are making headlines through the demise of their relationship, Olivia earns £10,000 per nightclub appearance and Jonny and Chyna embark on a social media feud. Of course, the pair have detailed their volunteering efforts on social media – and the subsequent and obligatory reality documentary, which Camilla announced on Instagram. We are on our way! Thank you so much to everyone who has supported us so far – we will keep you all posted on how we get on ? Thurlow, a bomb-disposal expert, did charity work before seeking romance on reality TV, including working for the HALO Trust – a landmine-clearing charity favoured by the late Princess Diana. It seems she’s continuing her philanthropic streak despite reaching D-list fame on ITV. Long may it continue, and long may TV producers give people like her a platform and TV viewers a great role model.